Green Bay Director of Athletics Mary Ellen Gillespie has been appointed to the NCAA Division 1 Women’s Basketball Committee. She will begin her five-year term on the committee on Sept. 1, 2015. 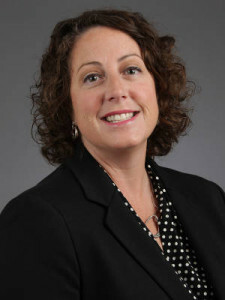 In the midst of her second academic year at Green Bay, Gillespie will become the first administrator in the history of the Horizon League to serve on the selection committee. In her first year at Green Bay, Gillespie oversaw an athletics department which captured four Horizon League regular season championships and sent two programs (men’s tennis, softball) to the NCAA Tournament. The leader of Phoenix athletics has also guided the athletics department through significant transition since being named the eighth Director of Athletics in school history back on Oct. 17, 2013. Gillespie has hired nine staff members and six head coaches.